Happy Firday all!!! It has come around so fast and we are already so far into March!!! 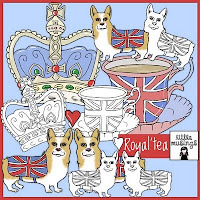 Anyway its a Friday so that means its Little Musings Day its a bit of a Royal Affair this week with corgi's, tea, union jacks and crowns, this digi set is brilliant especially for invites for street parties or just to add that special touch to your homes on that special day! Oooo and it did occur to me that this would make fab bunting too. I laminated the crown and teacup just so it lasts that little bit longer and doesnt warp when sat on the shelf. Make 2 images so that they can be sat how ever and the backs look just as good as the front, you will neeed to flip the image for the tea cup but the crown sits well together. Go check out the other Makes from Sj and Caz they are fab! These look great, I love crowns!